Winter is the season of rest for gardeners and our tools, which deserve a bit of special care before they are stowed away. 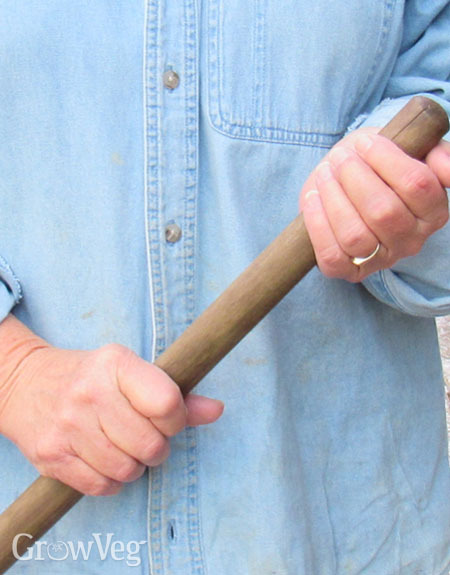 Ben Vanheems has already covered the care of pruners and small hand tools, so here I want to address the needs of gardening tools with long wooden handles. From spades to hula hoes, cleaning and oiling wood handles will extend the life of your tools, make them more fun to use, and put them in ready-to-use condition for spring. Things get chaotic in my big vegetable garden in summer, so I start by rounding up tools that are lost or left behind near the place I last used them. Once gathered together, I like to give them all a good scrub with hot, soapy water and a stiff brush, but this is not always practical on a cold winter day. Alternatively, you can clean dry tool handles with a metal brush and damp rag, the goal being to relieve the handles of soil and scum that has accumulated in the crevices. Should you encounter splinters or other rough spots, use fine sandpaper to smooth them out. A few years ago when I worked with a native plant rescue group, we marked our tool handles with brightly colored tape or paint to keep them from getting mixed up or left behind when we went on digs. What a revelation! Even though they rarely leave my garden, I now mark the handles of my most-used gardening tools to make them easy to find. Bright red bands make my spades and digging fork easy to spot, and I stain the handle of my favorite hoe orange so it can never go missing. Once wood handles are clean and dry, I like to finish them with a coat of oil to repel moisture and dirt, and to keep the handle from becoming dry and brittle. Linseed or tung oils are often recommended for this job because they dry quickly, but I’ve found that coconut oil or walnut oil work well, too. For this job you do need to bring your tools into a heated space, because any oil you use will penetrate wood handles best at room temperature. To get good coverage, saturate a cloth well with your chosen oil, and slather it on. Let the handle sit for ten minutes or so, and then wipe it down lightly with a dry cloth. A second or third oiling may be needed by older wood handles that have baked in the sun all summer, but once you’re done you will be amazed at the transformation. As a final step I like to oil the tools’ metal parts, too, but here any oil will do, including vegetable oil from your kitchen cupboard. A quick wipe with vegetable oil will set back rust spots and discourage new ones, while making tools look better, too. I save serious sanding and sharpening of gardening tools for spring, because even when stored in a dry place, blades can corrode a bit under damp winter conditions, and there’s nothing like a freshly sharpened hoe when you’re weeding spring carrots. But until then, there are small moments of pleasure to be had from simply picking up a restored tool handle and holding it in your hands. In place of dried mud you feel silky-smooth wood, and this will make you feel happy. Try it and see. "Can you tell me what brand of walnut oil you use for cleaning your wooden tool handles?"